Did I really order a guerrilla to break eggs? ‘You are in charge’, Z. said. We were standing in the kitchen and we wanted to make an omelette. Since there were no eggs in the fridge, Z. went out to get some, while I was making a basic salad. I’m no good at breaking eggs, so I poured oil in the pan and asked him to put the eggs in. He obeyed. He fried them a bit, but left the rest to me when his phone rang. I didn’t hear what the call was about, it was in Kurdish. ‘Done like this, right?’ I asked when he came back, pointing at the eggs. ‘Done’, he agreed. 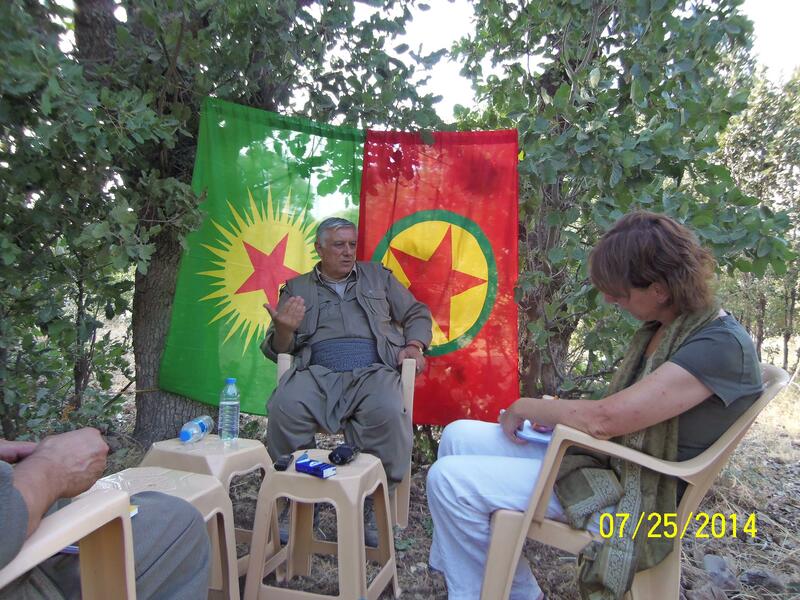 While interviewing Cemil Bayik, co-leader (with Bese Hozat) of the executive council of the umbrella organization KCK – or in other words: PKK’s second man after imprisoned Abdullah Öcalan. Isn’t it intriguing that whenever journalists go up to Qandil, you only see the result that they took the trip for: the interview with (usually) Cemil Bayik, or occasionally some other PKK/KCK leader. Reduced to a few minutes of video or a few hundred words article, and that is it. But while Z. was preparing our after-lunch tea (‘light for me please!’), I knew it would be interesting to share more about the trip as such. I know you readers are curious! So, do you go up there by yourself, do you rent a car or something? Nope. You arrange a date for the interview with Z. via e-mail, and then you are asked to be in Erbil or Suleymania the evening before the interview. You let Z. know where you will be staying, and he will send a car with a driver to pick you up early in the morning. Then you go, in some two and a half hours, to Qandil village. Which is not, as most people think, and as I used to think, close to the Iraqi border, but close to the Iranian border, about an hour’s drive (sometimes slowly on zigzagging mountain roads) from the town of Ranya north of Dukan lake. Did you know there are dozens of villages in the region that are under military control of the PKK? That thousands of villagers live there, and that people from outside the PKK-controlled area nowadays can go there for, for example, a picnic? And that the Iraqi state has access to the area with state services and that the PKK doesn’t interfere with that, but only controls the region militarily? Now you do. 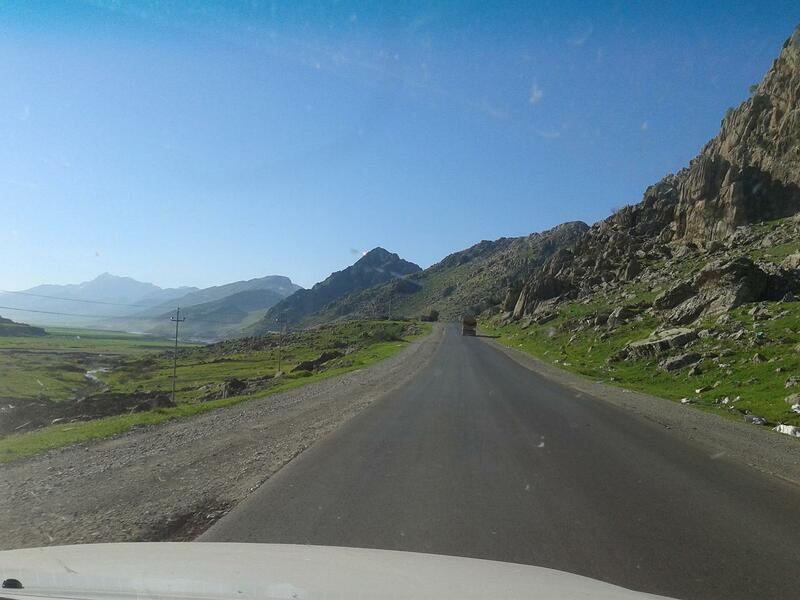 The trip to Qandil and back to Erbil costs 300 dollars. Not too expensive when you consider it’s all together a six hour drive with a private driver. But still, a lot of money for a freelancer like me, having yet to negotiate my costs with the media I work for. When I look in my wallet, I’d love for the PKK to just cover these costs since I don’t think they lack finances, but as a journalist, I would definitely refuse the offer. It’s better that I pay myself and get my investment back from the media I write for, than be treated by a party that is crucial for my work. A basic matter of independence. Going by yourself is, by the way, not an option. The PKK, and the man they hire as a driver, have contacts at the seven to eight check points you pass on the way, and without that, especially the last check point is apparently impossible to tackle. 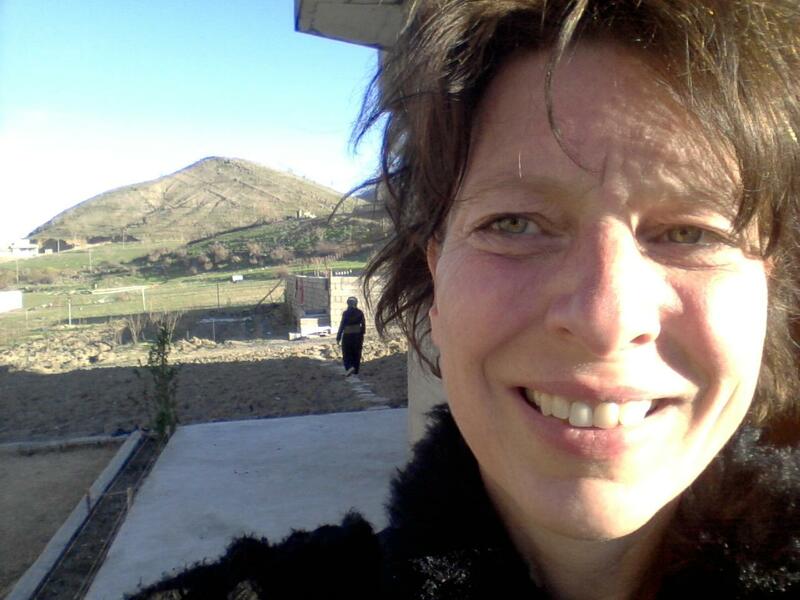 Selfie taken in Qandil village during a previous trip in March 2014. The previous time I went to Qandil, in March this year, I was welcomed to the same family house in Qandil village as this time, and tea and lunch were prepared for me. Difference: now it was Ramadan. Everybody was asleep when I arrived around ten o’ clock and the driver decided to have a nap too. So what could I do but nap? Then Z. came, he woke me up, we chatted a bit and then fried eggs and had them with salad, bread and yoghurt. After that, I fell asleep as Z. went away to ‘arrange some things’. By the way: no, guerrillas don’t fast during Ramadan. Z. explained to me: ‘You know, the point of fasting is that you acknowledge the suffering of other people. Guerrillas acknowledge that already, otherwise they wouldn’t have become guerrillas.’ Right. 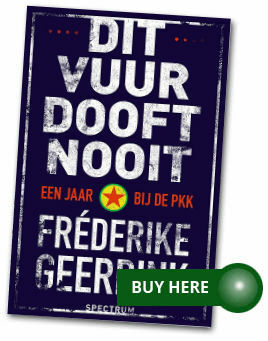 Maybe PKK guerrillas just aren’t very religious, I thought, but I suppose that’s marketing-wise a less smart thing to say. 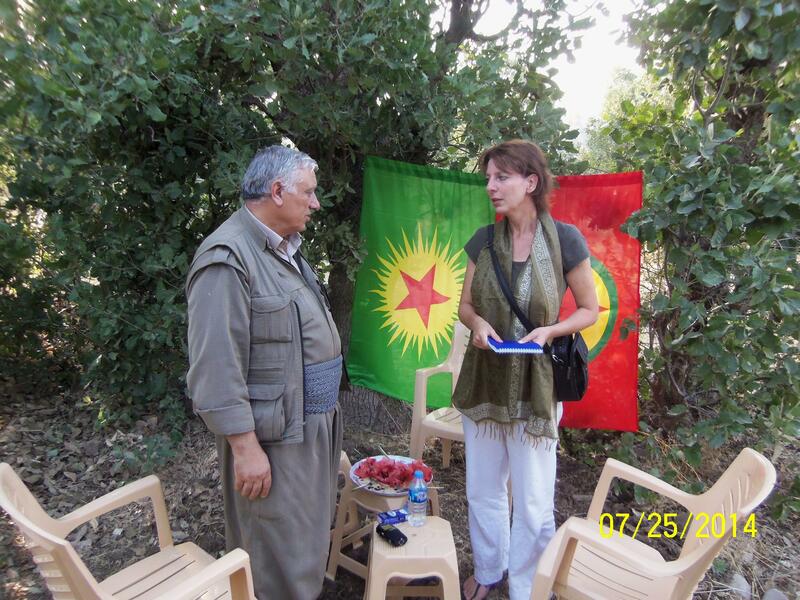 Also, nowhere near all PKK members joined the organization because they were aware of other people’s suffering. Sometimes they were traumatized themselves and just didn’t know where to go in desperation, or they were women wanting to escape oppression at home, just to name some reasons other than idealism to join the guerrillas. Around two, Z. and I left for the interview. I had to leave my phone behind – too easy to track down, of course. After a short ride with a PKK driver, partly on the main road and partly through the bush, Z. and I got out of the car. 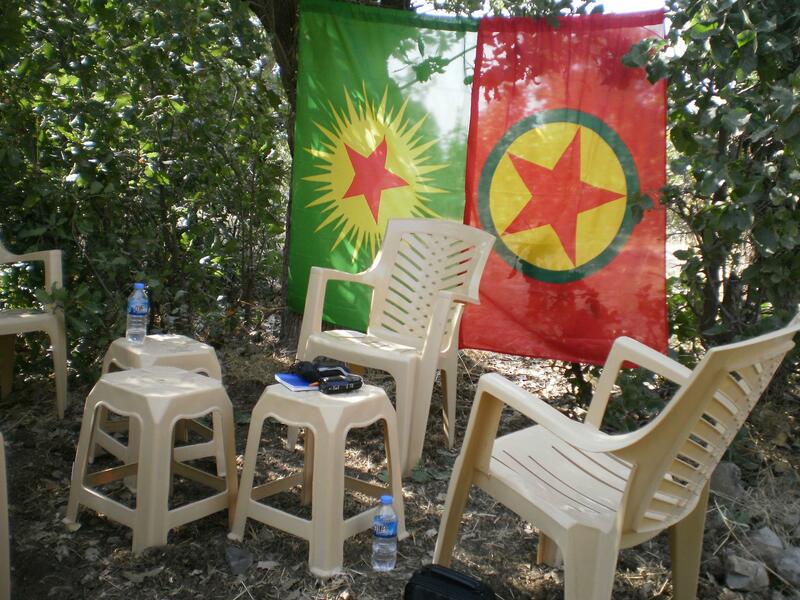 We walked some five minutes, and there I saw the set up: the PKK and KCK flags on a line between two trees, a small plastic table and four plastic chairs in a circle in front of it. Two guerrillas were present, they offered me water, and we waited for Bayik to come. When I saw footage of earlier interviews with Bayik, I always had the idea such interviews were held in the camp where he was located. But it turns out it’s done every time in a different spot somewhere in the middle of the wilderness – logical of course, the security risks are too high. Bayik came some fifteen minutes later, accompanied by some seven armed guards who positioned themselves in a circle around us. I hardly noticed them, they were quietly present, professional as could be. We couldn’t finish the melon. After the two hour interview (about which I hope to publish in several media – stay tuned! ), it became clear what Z. had carried with him in a seemingly heavy plastic bag: water melon was served. Cemil Bayik and I ate, we chatted a bit, shook hands, said goodbye, and he and his guards left. ‘Thank you for the interview’, I said. ‘Don’t thank me’, he replied. ‘It’s my duty’. Z. and the two guerrillas started cleaning up the place. Flags down and neatly folded, chairs piled up, forks and plate in a bag, and empty plastic water bottles in a small garbage bag. When we walked away, no trace was left of our presence there. I thought of a sign I saw as a kid in a Dutch forest: ‘Leave only footsteps, take only memories’. After iftar, the driver took me back to Erbil at high speed, and before midnight I was flat on the same bed from which I got up that morning. A funny feeling took hold of me. Did I really order a guerrilla to break eggs? Did I really fall asleep in Qandil while waiting for an interview with Cemil Bayik? Did I really do this interview, and did we really chat and eat melon? And was I really in a circle of seven heavily armed men and hardly noticing it? I did. Welcome to my sometimes surreal life. Here’s the interview with Bayik I wrote for Beaconreader (pay a bit, it’s worth it). Great article as always….thank you.